The KAI Cube Electric Sharpener will help you keep incredibly sharp edges on your Shun knives, helping to maintain the integrity of your cutlery for years to come.. This electric knife sharpener, made for Japanese cutlery, can sharpen an edge to the 16°edge that makes your Shun cutlery so incredibly sharp. Many other knife sharpeners can only grind your knifes to a 22°edge, the standard angle for German knifes. It's important to sharpen your Shun knifes with a 16°sharpener if you want to properly renew the famous Shun sharp edges. Sharpens fine, double-bevel cutlery with a 16°angle on each side. Sharpening slot keeps you at the correct sharpening angle on ever steady pull-through. 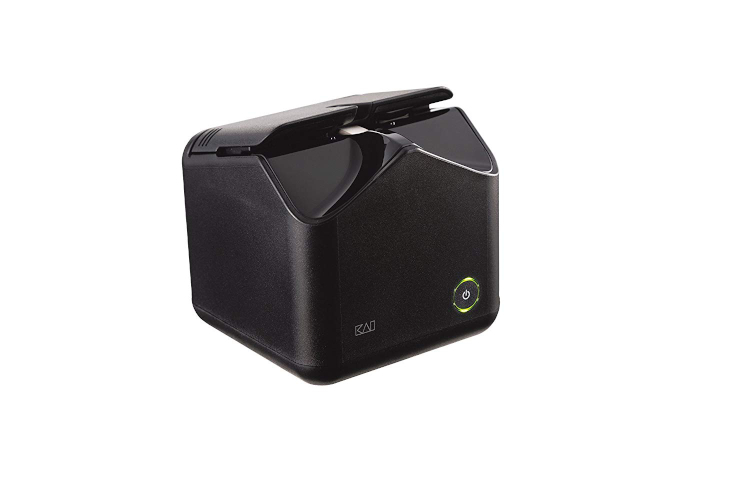 Easy to clean; sharpener comes apart for easy cleaning of interior and sharpening stone. Not to be Used on single-bevel, serrated or ceramic knives. Do Not Use on scissors. Weight: 1 lbs. 8 oz.